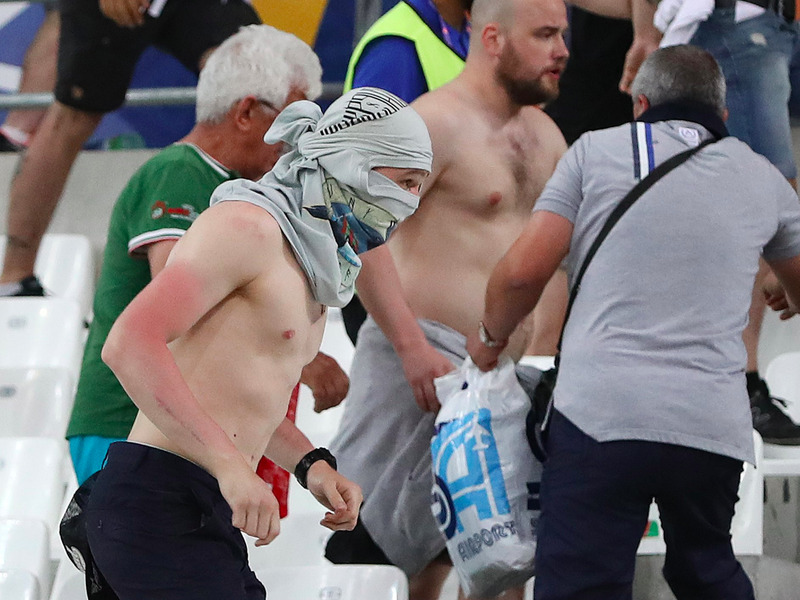 (AP Photo/Thanassis Stavrakis)Russian supporters charges at England fans in the stands at the end of the Euro 2016 Group B soccer match between England and Russia, at the Velodrome stadium in Marseille, France, Saturday, June 11, 2016. German bonds went negative. Fears of a possible Brexit and economic concerns pushed yields on Germany’s sovereign debt into negative territory for the first time on Tuesday, meaning investors are willing to actually pay to hold German government debt rather than receive any return. There’s still a lot of oil. A huge overhang in oil stocks lingering across the world will keep a cap on any further oil price rises, the IEA said, even as supply and demand move towards balance by the end of the year. The EU is struggling with Turkey. The European Union’s top diplomat in Ankara has stepped down after a row with Turkey over controversial comments he made on a landmark refugee deal, a spokesperson from his office said on Tuesday. Morgan Stanley aims to win where others are stalling. Morgan Stanley is targeting quarterly revenue of around $1 billion for its fixed income, currencies and commodities trading unit, Chief Executive James Gorman said. The ECB is gearing up for a Brexit intervention. The European Central Bank would publicly pledge to backstop financial markets in tandem with the Bank of England should Britain vote to leave the European Union, officials with knowledge of the matter told Reuters. Protests continued in France. Several hundred masked protesters hurled objects at police Tuesday during a demonstration in Paris against a contested reform of French labour laws, authorities said. A US fund shut its doors. Platinum Partners, the hedge fund firm linked to a New York City corruption scandal, is returning a majority of its assets to clients, a person familiar with the situation told Reuters. There’s change at Deutsche Bank’s Asian headquarters. Deutsche Bank’s Asia Pacific Chief Executive Officer Gunit Chadha has decided to step down from his role at the German lender, with effect from July 17, according to an internal memo seen by Reuters. 1MDB is being sued for billions. Abu Dhabi’s state-owned International Petroleum Investment Co (IPIC) said on Tuesday it has asked a London court to arbitrate in a dispute with Malaysian state fund 1MDB in which IPIC is claiming about $6.5 billion. The EU won’t stop a US hotel merger. EU antitrust authorities are set to wave through US hotel chain Marriott International’s cash and share purchase of Starwood Hotels and Resorts Worldwide Inc without demanding concessions, a person familiar with the matter said on Tuesday.